The Queen Mary Legal Advice Centre is committed to offering both a welcoming and confidential environment for members of the lesbian, gay, bisexual and transgender (LGBT) community when seeking free legal advice. 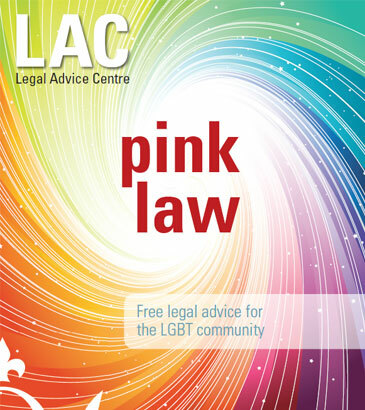 As part of this on-going commitment, and in response to requests from the gay community for advice specific to its needs, we launched Pink Law, which gives free and impartial legal advice to the LGBT community. We offer this service on a monthly basis, advising clients on a range of legal issues including: discrimination; civil partnership formation and dissolution; cohabitation issues; immigration; wills and probate; and hate crime. Pink Law was highly commended in the Best New Pro Bono Activity category of the LawWorks and Attorney General Students Awards 2009, and our students won the Best Team of Students category in the same Awards in 2010. In addition, we have worked with leading LGB campaigning organisation, Stonewall, to produce information leaflets on civil partnerships, gay fatherhood and employment discrimination. When C considered dissolving his civil partnership, he was understandably distressed and confused. He came to us for advice on how dissolution would work and how it would affect his property. C had been through so much with his partner; supporting him financially and emotionally through university and driving lessons, as well as supporting his family and making arrangements for him to move to the UK from the Philippines. Sadly, over time, the couple drifted apart and events led C to contact the LAC for advice. We explained to C the process and requirements for dissolving a civil partnership; taking into consideration the consequences this would have on C’s property and his partner’s immigration status. After receiving his advice letter C wrote to the LAC to inform us that taking the step to ask for advice had actually saved his relationship. He described the LAC as 'an understanding service you can trust in times of distress'.